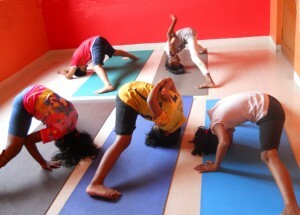 Asanas and Pranayama have profound effect on the physical and mental development of children. Regular practice improves posture, inner awareness, builds personality and character, sharpens intellect and develops positive thoughts and emotions. Children will improve their concentration and memory, develop physical and mental strengths, enhance their learning abilities and acquire many new skills and make them successful in whatever they do. In Geeta’s class they learn the right ways of standing and sitting, and being loving, gentle, calm and patient. The classes also educate them on eating healthy foods and developing healthy habits.